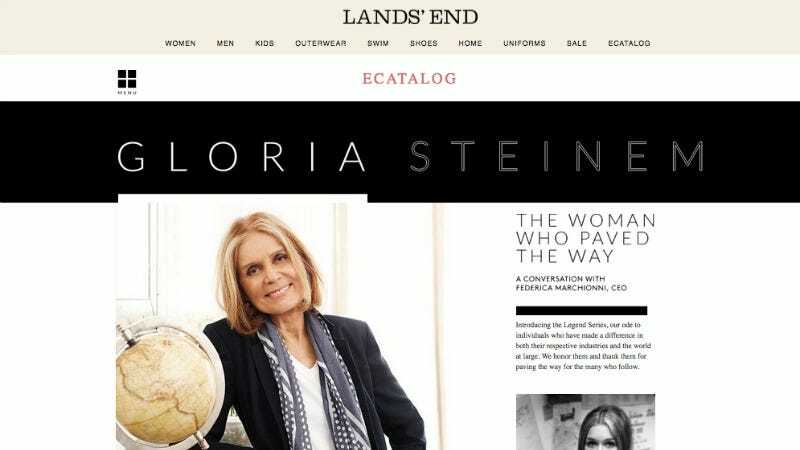 Did Lands' End Delete an Interview With Gloria Steinem to Please Pro-Lifers? The conservative corners of this nation are currently coming to a boil over the fact that Lands’ End said something nice about Gloria Steinem in its spring catalog. The package also announces that you can get the ERA Coalition logo monogrammed on various Lands’ End items, and the company will donate $3 to the ERA Coalition’s Fund for Women’s Equality for each piece ordered. Meanwhile here in the good old USA, I just received a clothing catalog from Lands End. OK – good so far, nice clothes, modest, feminine – wait – what the ! A three page spread in their latest catalog on Gloria Steinem “Legend”. Has this country come unhinged? I can’t even shop for clothes without being exposed to agitprop? The Stream declares: “Once Family-Friendly Lands’ End Catalog Celebrates Abortion Radical Gloria Steinem.” LifeNews (come on, they wouldn’t miss this party) goes into great detail about the dreadful dangers the ERA would pose to anti-abortion legislation. The story even got the Erick Erickson signal boost/batfetus. You’ve lost my business (and the business of my large family) until Gloria is no longer glorified on your website and you stop donating to her fund. This family will not buy one single thing from Lands End ever again unless this drive highlighted by Gloria Steinem is fully retracted. You’ve had great customer service for bookbags for us in the past...never again!!! Lauding Gloria Steinem is beyond what I can understand from a company that ‘appears’ to celebrate family. We won’t be purchasing from you any longer. Our family is *not* ok with your donations to an organization that supports abortion. No way. Really a shame. I have four kids, by the way, and you were my go-to place for coats and pajamas. Bye-bye. I will take my business elsewhere. One of the outraged comments has a response from Lands’ End, calmly explaining how the customer can unsubscribe from their emails. The company’s bevy of conservative customers has gotten them in hot water before; just look at the furious 2014 freakout from customers who did NOT appreciate that scandalous free copy of GQ. (They also do a brisk school uniform trade, including Catholic and other private Christian schools.) But at this point the Internet shitstorm is underway and there’s not much Lands’ End can do to stop it. Might as well just—ahem—lean in, right? Lands’ End does indeed appear to have responded to this onslaught by totally scrubbing the offending interview. The cached original was up briefly, but good luck finding it on the website or in the online catalog. The ERA Coalition logo, however, is still among the monogramming options. L.L. Bean totes hold up better, though. Correction 2/25/2015 1pm: This post originally misstated where donations were going, listing a U.N. women’s fund, rather than the ERA Coalition’s Fund for Women’s Equality.